And you think you’re cold? Did you know that they used tin buttons on the uniforms for the Infantry in Napoleonic France? They did–at the waist of their trousers or breeches and on their coats. 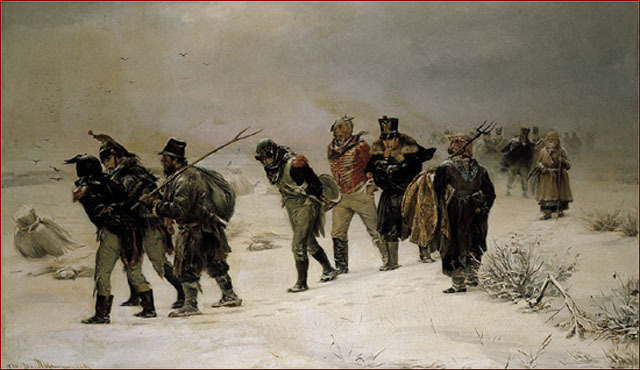 The temperatures at night during the retreat from Moscow in late November of 1812 plummeted to -30C. And tin, when exposed to such temperatures, does something quite remarkable. It turns to powder. The poor blighters couldn’t even keep their trousers up. Or their coats buttoned. This entry was posted in Did You Know?, History and tagged 1812, Invasion of Russia, Napoleonic history. Shame binder twine hadn’t been invented! Great snippet, by the way. Canada is cold. Even in a big fat winter jacket did I tremble from the cold. I found myself wondering how the people in the Regency era stayed alive outside during the winter! You probably are wanting a post on winter clothing, aren’t you? The men would have been wearing fine knitted wool socks inside those boots of theirs. They’d probably also be wearing two waistcoats, both of flannel (wool) and one of them might even be a quilted waistcoat (yes, they did have such luxuries, and the wadding inside would have been wool too) and they had their coats and then their greatcoats and mufflers. For the women, again, fine or not so fine wool stockings, and brushed cotton petticoats–more than one usually. The gown would probably be made of a type of wool muslin–think a thin muslin weave, but made with merino, rather like Viyella. And then, to go out, a wool coat. Indoors, they had the huge India shawls brought into fashion by Josephine–she was known to wrap herself in more than one of these in the winter. But still, there was a reason so many of their activities took place in one room in the house–the room with the largest fire usually. Sounds like our house. Central heating made the Border Collie itch so we switched it off and pulled on extra jumpers.